Caption: Back so sone Judas...er, ahm,...I mean, Bruce? Caption: Class, How many parties do we really have? Caption: Dem couldn't fine a shut fi fit bruce, poor thing..
TWO shirt instead of the one PJ offer him! 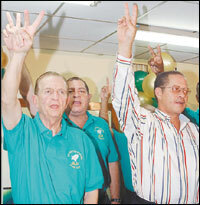 Caption: Audley Shaw thinking "prime ministership gone :("
changes his stripe or is it a Zebra. Bruce confused!! Caption: "Training in Session" - Lets exercise those fingers!! Caption: Somebody lost their green shirt!! Thank you for the 153 responses we received. Enter again and we hope you will be the outright winner next time.